for ATVs, motorcycles, ROVs, and 4x4 vehicles. motorcycle, ATV and 4x4 recreationists. of OHV recreation opportunities for all skill levels. and a 4x4 obstacle course. of beach and coastal sand dunes. The Off-Highway Motor Vehicle Recreation Division’s proposed modifications to the Grants and Cooperative Agreements Program Regulations and Documents Incorporated by Reference were approved by the Office of Administrative Law and filed with the Secretary of State on December 14, 2018. The approved modifications will go into effect on January 1, 2019 and can be found on our regulations page. Hello from the Off-Highway Motor Vehicle Recreation (OHMVR) Division! The closure period will include the necessary time required to complete pre and post inspections of the land with the Bureau of Land Management (BLM). The adjacent Johnson Valley OHV Recreation Area, managed by the BLM, will remain open to the public for recreation purposes during the closure of the Shared Use Area. Off-road enthusiasts can also enjoy the nearby Stoddard Valley OHV Open Area. The Marine Corps will continue to implement robust outreach to ensure proper notification when the Shared Use Area is reopened for public access. 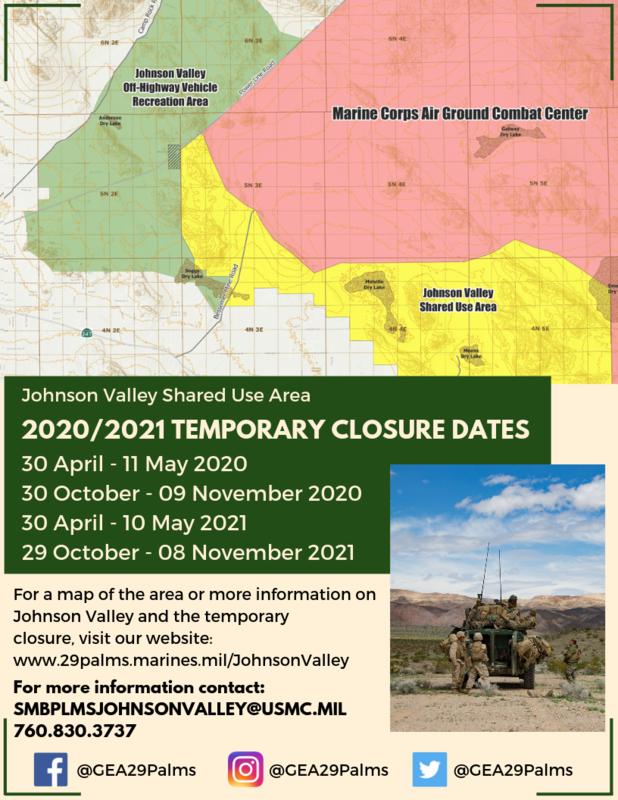 For additional information, including a map of the area, please visit: http://www.29palms.marines.mil/johnsonvalley/ or contact the Marine Corps Air Ground Combat Center Resource Management Group at 760-830-3737 or SMBPLMSJOHNSONVALLEY@usmc.mil. The California Department of Parks and Recreation, Off-Highway Motor Vehicle Recreation Division (OHMVR Division) announces its Final Awards for the 2017/2018 Grants and Cooperative Agreements grants cycle [more info...].